Almost all of the 138 participants who took part in the Mini E trials, said they’d consider buying an electric car. These are the findings, which were published today by Mini after a yearlong field test in which 62 members of the public and 76 pool users were given Mini E's and the results collated. The findings have also highlighted that the average cost per mile came in at under 2p, the equivalent of £60 per six months charge on average. Four out of five people said that 80 per cent of their trips could be covered by the Mini E, rising to 90 per cent of trips with the addition of rear seats and a bigger boot. Over the one-year period, over 250,000 miles were recorded on UK roads, with the average distance driven coming in at just under 30 miles per day. Interestingly, virtually all the car’s recharging took place at home at an average of 2.9 times per week. 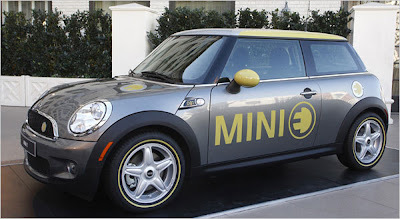 The results also found that a full charge enabled the Mini E to travel a distance of 90 miles, although cold weather affected its range, according to 84 per cent of owners. Driver enjoyment was a big factor noted by the results, too. With its 201bhp power figure, all participants agreed that “electric vehicles are fun to drive,” thanks in part to the car’s fast pick-up and quick accelaration”. Finally, the findings have revealed that only one week was needed by people to adapt to the peculiarities of driving an EV, including charging, regenerative braking and near silence during driving. The test results will be used to help develop the all-new BMW i3 - an electric city car due in 2013 – as well as the 2011 BMW ActiveE, a four-seater based on the current 1-series.